Galway East Tourism - Dartfield Horse Museum in East Galway, West of Ireland.Galway East Tourism - Dartfield Horse Museum in East Galway, West of Ireland. Dartfield demonstrates the history and importance of the horse in transport, farming, sport and local traditions. Set on 350 acres of parkland. Meet the horses and browse in the gift shop. "Spend a day at Dartfield and discover an interest that could last a lifetime". 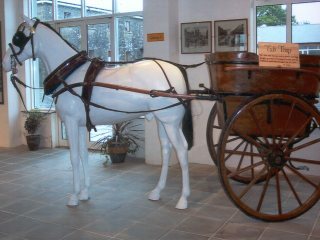 The museum charts the history of the horse and its use from the earliest times to the present day. But Dartfield is not just another boring museum. There are live exhibits to delight everyone. Some of the world's favourite breeds of horses can be seen. From some of the biggest horses in the world - to the smallest. Exhibits include farm machinery, carriages, harness and interesting artefacts from the horse world. There is an art gallery and library. Visitors can ride the mechanised horse. For younger visitors there are rocking horses and computer games. There are occasional demonstrations of horse-shoeing and the saddlers skill. Discover more about the horse with the Interactive touch screen computers. The Hall of Fame details some of Ireland's most famous equine superstars. There is a caf?, serving snacks and a shop, selling unique horse related gifts. Dartfield is set in 350 acres of parkland. For no extra charge visitors can enjoy the walking tour, along safe level pathways and see cattle, deer, sheep and ponies. All of the family will enjoy a day at Dartfield. The museum has facilities for the disabled. It is an ideal venue for coach parties and school tours.